We will be open for tastings from noon to 5 pm on June 23 and June 24. Over this weekend, The Summit Wineries*, a wine trail consisting of five wineries in the Summit Road vicinity in Los Gatos, will host special tastings and a scavenger hunt. At Villa del Monte, we will be sampling artisan chocolates from Monterey Chocolates, including chocolates infused with Villa del Monte wine. Yum! And, 15% of all purchases during this weekend will be donated to the Summit Watershed Protection League. All purchases are eligible for our standard multi-bottle discounts. Call 888-788-4583 now for a tasting appointment and directions. Can’t make it to the winery this weekend? Place an order online and use the code “forest.” We’ll donate 15% of online purchases made through June 30, 2012. * Each winery’s tasting fee/policy applies. 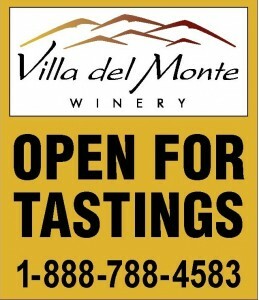 At Villa del Monte, tastings are $5 per person, refundable with purchase.